I picked up this beauty yesterday. 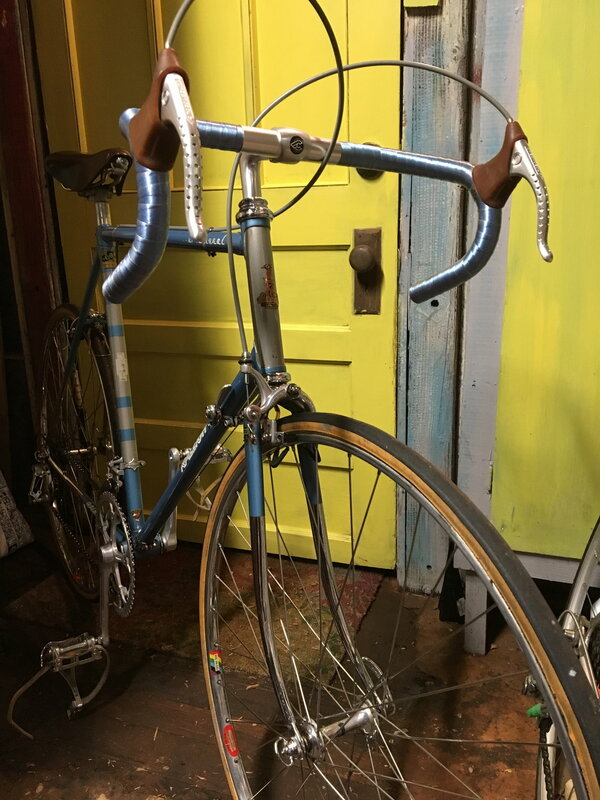 1974 Raleigh Professional, mix bag of campy components and cinelli stem/bars. The original owner built it over a few years after buying the frame from a shop he worked at in the early 80s. Apparently the frame was ordered and the guy never showed to pick it up and it sat in the back of the shop for a few years. Some components were shipped from Italy while he was studying abroad in college. Really nice guy, very cool story. But I digress. The tires need replacement and this is my first time dealing with tubulars. I typically stay away, but the original wheel sets are too good to swap out and I’d like to expand my knowledge as well. Last edited by Raleigh74; 10-22-18 at 06:46 PM. I noticed that too, right after I got it home. If you can swing the cost of Vittoria Corsa G tubulars, they are one of the best riding tubs out there right now. The big plus is they come in skinwall which is getting harder and harder to find on tubs. At around 80 bucks a tire, they are not cheap but not crazy expensive either. If you think you might want to just try tubs out and cannot yet decide to commit to them, you can start out with entry level tires like Vittoria Rallies or Continental Giros. Just examine the closely if you can before you buy them for good tread alignment and minimum lumpiness at the base tape at the valve area. Very pretty bike. I'm a recent convert and began 7 years ago with Gatorskins knowing they are comparatively harsh but more durable. They are a bear to mount and the nicer Competitions are even harder to mount. I've heard that other makes are easier to stretch onto the rim but I am a Continental fan boy. Whatever you get, get two plus a spare and make sure they have removable valve cores so you can use sealant if you go,that route. A cool bike like that deserves cool tires. And the coolest tires are tubulars. Stick with it. Don't let the others dissuade you. In order of preference: FMB Roubaix, Veloflex Roubaix or Vlaanderen, Vittoria Corsa G. Judicious shopping will get you any of these for around $80 a tire, but the FMBs will require more patience. IMO FMBs are worth the wait or paying a bit more. Once you buy any of those, put them on a rim, pump them up, and park them in a dark corner of your basement for aging. Check pressure about every three days as they will go down. While letting the good stuff age, go buy some lesser tires to ride in the mean time. After about six months (Winter is comng) mount the good stuff for the spring. I bought a set of Vittoria G+ Corsa's (28x27) last month at PBK for $128 Cad including shipping.. Had them in 8 Days. Just watch their sales and get on their mailing list. Quite often they offer 12% off coupons. The 25's are on sale now. I also am a great fan of wide Vittoria tubulars, but I want to get FMBs for my next set. Whatever you get, look for 27-28 mm width. The ride is amazing. Thanks for the suggestions guys! $119 for a pair of Vittorias seems like it may be my best bet right now. That's probably the worst way to get started on Tubular Tires. The set I tried were more square than round and rode like a garden hose filled with frozen water. You get what you pay for. 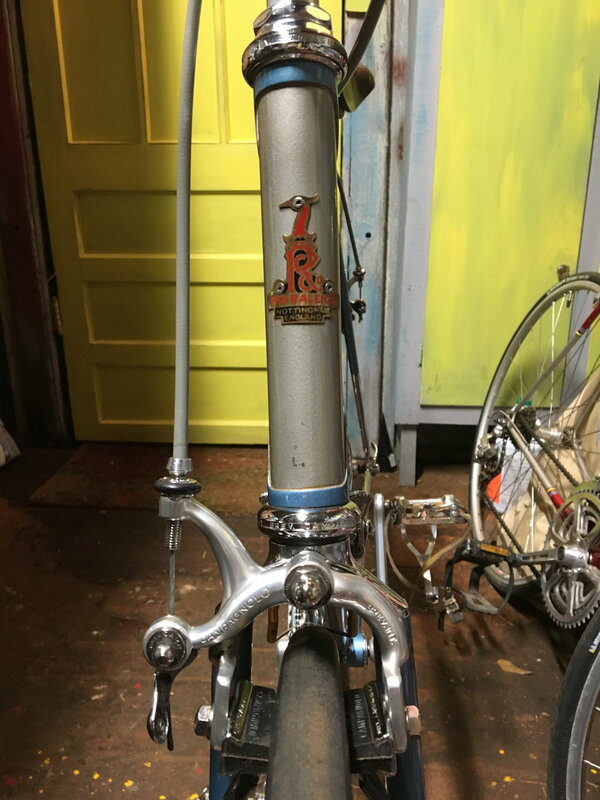 I've got a copper International and a Raleigh Team in team colors, and still have the urge to pick up a Pro in the blue mink & silver paint scheme... <sigh>. Raleigh's marketing was certainly effective in my case! as far as tubulars go, I've got some Conti Sprinters on my Olmo. Nice tires, well made, durable, but not especially thrilling. Not so fond of the black sidewalls either. I think I need to try some that Lynn suggested. I like this stuff right here. Good. Actually for me that link is showing the 28’s as even a couple dollars less than the 25’s. Those of you running 27-29mm tubs, what pressure do you like? 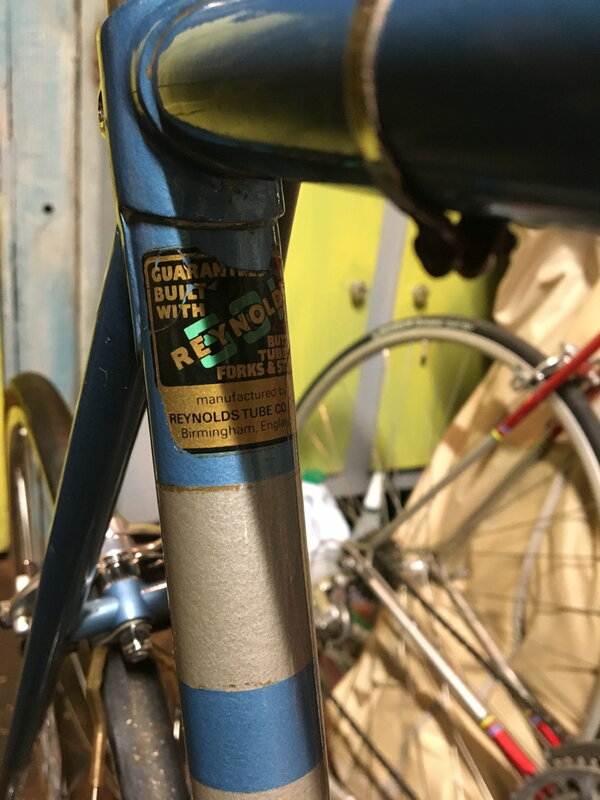 I have a pair of Challenge PR on a bike (I know these get mixed reviews but I have been OK with them) and they say 95-135 psi. I generally go around 90. The pair I received last Month were 28's but I wonder if they sent me "seconds" as there was only the Red Corsa labeling on one side of the tire's. The 2 sets of 25's I have on other bikes have the labeling on both sides of the tire. I like it though as I mounted them with the labels on the non drive side. To me the non labeling gives a much cleaner look to the drive side. I run them at 90 rear and 80 front. I am 6'1" at about 225lbs. LOL I never minded the rally tires until I used a tufo s23 for a spare. Then I thought the rallys were racing tires. Seriously though the rally is ok if you need a cheap tire to run on crap roads and you are very good at mounting them. Like the @Wileyone said they are not for the first timer. The conti sprinter is a very good tire for ride and durability but only available in blackwall. My favorite was the vittoria Pave but that is no more. Now my choice is the veloflex roubaix. It has the looks, ride and seems fairly durable. To those using the corsa, how do they compare to the old pave? I’ll just put it out there for fans of the Continental Grand Prix 4000 clincher - these come in a tubular version as well. Yes they are black wall. The tread pattern is the same Grand Prix 4000 that many of us love. They cost about 70-80$ each on sale. They lay flat and should be hump free due to not being sewn. The tire is more of a lamination and the cotton base tape lays copletely flat ala TUFO. I like this concept myself and wonder why this particular model isn’t mentioned much. I don't have the tubular version but the clincher version of the Vittoria Corsa G Graphene is heaven to ride. I have both 23 and 25's. Haven't tried the 25's yet. My next sew up set will be theses. Yes AFIK there are only 28" (700c) tubulars and 650B tubulars. Has anyone ever used Challenge tubulars? Those are Super Champion Arc en Ciel tubulars in the OP's pics, far better than the OEM wheels and later production. 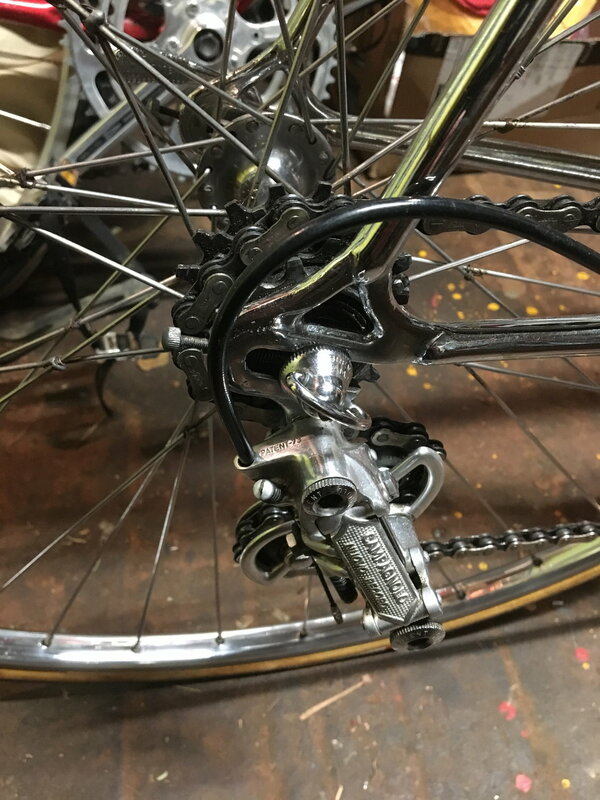 Any modern Vittoria or Continental tubular tires will be far better tires than the Clement 50's that many MKIV Pros were shod with OEM back when. OP: A very nice/very tall MKIV in excellent nick w/ good non-OEM build spec including a 54T chain ring. 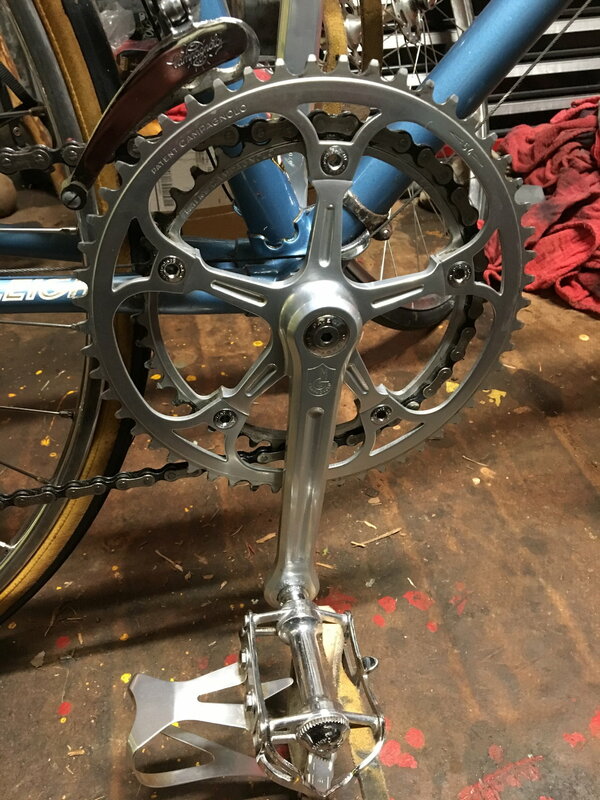 As John Howard once said after winning the US National RR Championships (again) on a MKIV: " 52T chain rings don't cut it". Pretty much my sentiments too, but I haven't tried the Vittoria. Probably because if I see a deal on tires, I buy them whether I need them or not. I have 2 sets of the FMB PRs under my basement stairs I got at the Madison swap for $80 total. On top of that, if you are looking for some fat tubulars, 32-34mm, I highly recommend the Dugast Pipistrello. The file tread pattern is not ideal for the road, but it's not bad either.